If we're supposed to be the crown of creation, then why have we apparently been deprived of the power flight? If the lowly birds and bees do it then why can't we? Sure we don't have wings or we're built differently, but that doesn't mean we can't do it. It's easy to fly in your dreams but that's because you don't have your physical body to lug around. Yogis, saints, and other adepts have managed to levitate after prolonged fasts, but few if any have actually gone further. There are ancient legends of Chinese masters who were able bodily to take flight in battle, if only for short periods of time. Now movies like The Matrix are hinting at this ability. 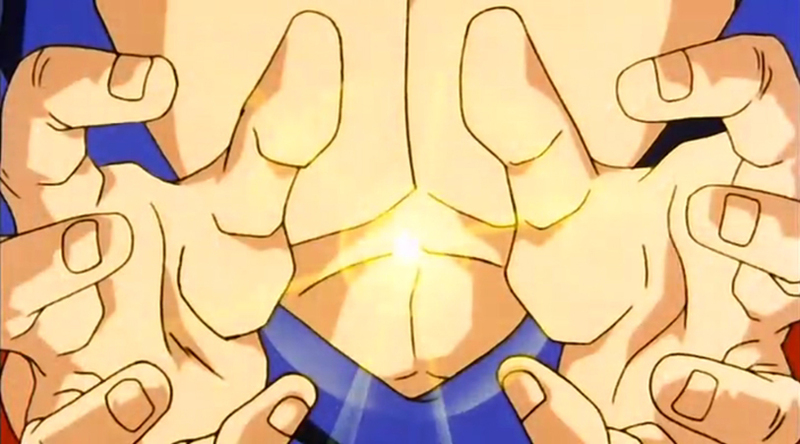 In the 8th episode of the Saiyaman Saga in the popular cartoon series Dragonball Z(207th overall episode), Gohan teaches Videl(and Goten) how to fly by concentrating on the solar plexus energy located in the belly and controlling it to fly. (see image below). Yeah, I know it's just an animation, but sometimes that's how the elite give us the truth -by putting it in movies or animations. Powering up the aura or magnetic field around you through fasting or breathing techniques seems to be the key. When the auric field is strong enough, it can literally lift you off the ground and even serve as a kind of craft or ship. In occult literature, this is called the Merkaba, or light body, which can transport you to any part of the universe or any dimension. It is made up of two counter-rotating tetrahedrons(your mental and emotional bodies) and looks just like a flying saucer when fully activated. Atlanteans activated their merkabas regularly, but we have long since lost or forgotten how to do so. So yes, you CAN fly, or better yet -teleport, but you must first reawaken your light body to do so.